I've been craving a lot of things lately, maybe because I haven't been baking as much. 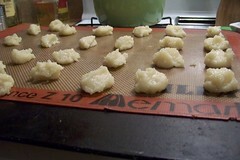 I've been hurting for some almond croissants, a while back I bought some almond paste to try to make something of it. Instead, I made amaretti cookies. Little fluffy melt in your mouth but packed with flavor almond cookies. They are on sale in the bakery department, $7 for 6 or something, I didn't want to buy them (plus, who knows where they've been) so I looked up how to make them. Then I read the same recipe I found online on the inside of the label of the almond paste. So I made them. Quick and easy. And delicious. I'm bringing some to a friend for his birthday party tonight, so I had to come upstairs so I wouldn't eat them all before we leave. 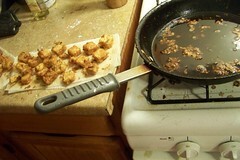 Also, I wanted to talk for a minute about the Chinese chili chicken I posted about the other day. It was so good I've been thinking about it a lot. 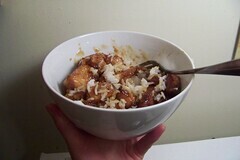 I wanted to make it again, but less spicy, and with tofu. So I made it last night, and it was pretty awesome. I used the silky firm tofu we get at the Asian grocery store (also sold at other places for more money). It held the batter better with a dusting or cornstarch, then a quick fry. It was a great idea. The tofu was perfect and crunchy, holding the sauce well, and then when you bit into it there was the smooth, creamy, almost melting in your mouth tofu in the middle. Yum. In the food processor, Mix the almond paste and the sugar. Pulse until very fine. Add the egg whites, one at a time. Pulse until very smooth. You're supposed to pipe them in a pastry bag into little circles, but mine were too thick, and I'm too lazy, I just dropped them by little rounded spoonfuls onto a silpat-ed cookie sheet and baked, 12-15 minutes at 350. 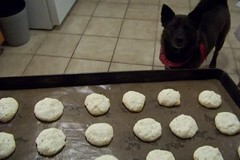 Jill - These cookies sound delicious and I love almond paste and marzipan. Those sound really tasty. I wonder if they would work with an egg replacer of some sort. Any idea? Sheltie Girl- They're so good. I handed them out at work and everyone loved them! Sally- I don't know much about egg replacers, sorry! Let me know if you try them and find something that works, though! Lizzie- Oops! Ill get right on that! They look so good! Yet easy and simple to make! Thanks for sharing. Btw I found a lot useful Chinese food recipes on this website Chinese-Food-Blog.com, maybe you want to have a look.